The 29-mile long, 11,700-acre Tennessee Valley Authority (TVA) lake has more than 240 miles of shoreline. And its deep, cold waters provide the ideal habitat for a variety of fish. In fact, record size muskie and walleye have been pulled from its depths. And many believe it’s one of the best smallmouth bass fishing lakes in the country, including the Fisherman’s Bass Tournament Circuit, which has held a Hall of Fame Classic at Fontana. Fontana Lake is unique in many ways. Unlike most lakes in the area, shoreline development has been kept to a minimum. More than 90 percent of the land around the Lake is owned by either the National Park Service or the US Forest Service. Maps of the Lake are available at local fishing stores. 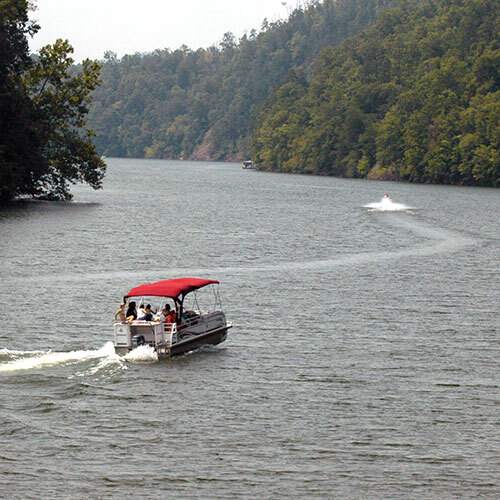 Those fortunate enough to go boating on Fontana Lake have a unique perspective of the Great Smoky Mountains National Park. At places the view is unobstructed from the lake level to the top of towering Clingmans Dome, the Park’s highest peak. There are a number of private marinas where you can rent a boat, or put your own boat on the lake. You’ll find knowledgeable staff, and plenty of boating and fishing supplies. Shuttle service is offered to Eagle Creek and Hazel Creek – two north shore locations where you can spend time fishing, hiking, exploring and camping in the National Park. 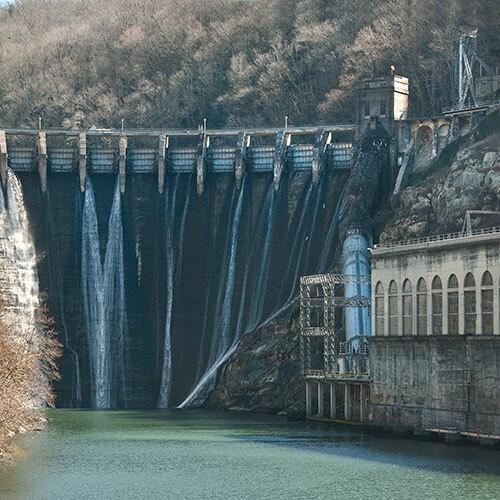 The 2,147-mile Appalachian Trail crosses Fontana Dam providing a beautiful view of the lake and powerhouse. Learn more about the AT. 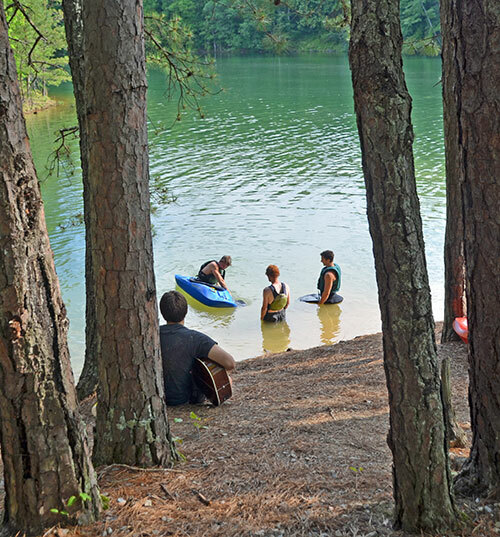 Annual Drawdown —Fontana is a man-made lake with lake levels controlled by the Tennessee Valley Authority (TVA). From September – November TVA lowers lake levels 60-feet to allow for winter snows and spring rains. Fontana is a very deep lake, so even with lowered lake levels fishing is not compromised and public access ramps are open all year. For more information, read this History PDF. Read a family’s account of a day at Fontana and Cheoah dams. In the mountains, most river and lake banks are simply too steep and too rocky to serve as a beach. One exception is the Finger Lakes Day Use Area of Fontana Lake where you’ll find a small park with picnic tables, public restrooms and a swimming area. Since there are no life guards, you naturally swim at your own risk. Finger Lakes is also a popular access area for canoes, kayaks and other non-motorized boats. 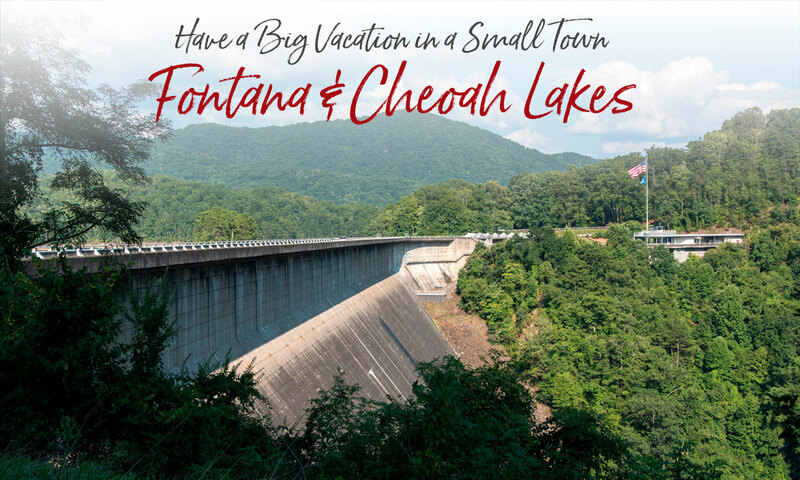 Cheoah Lake was formed in 1919 and is the oldest dam on the Little Tennessee River. Cheoah is 644 acres and 9.5 miles long. At the time it was built, it was the world’s tallest overflow dam at 225 feet and had the largest turbines in the world. Cheoah Dam was made famous in the 1993 movie “The Fugitive” in which Harrison Ford “jumped” from the top of the dam to avoid capture by Tommy Lee Jones. Today the dam is referred to as the “Fugitive Dam”. Bordered by the Great Smoky Mountains National Park and Forest Service, Cheoah Lake’s shores remain undeveloped and pristine. There is only one boat access ramp – Llewellyn Branch – at the upstream end of the lake, just below Fontana Dam. This ramp and adjacent fishing pier are both handicapped accessible. Because the lake is fairly narrow you won’t see much in the way of pleasure boat or jet ski traffic, only the occasional fisherman in search of trout and muskie. 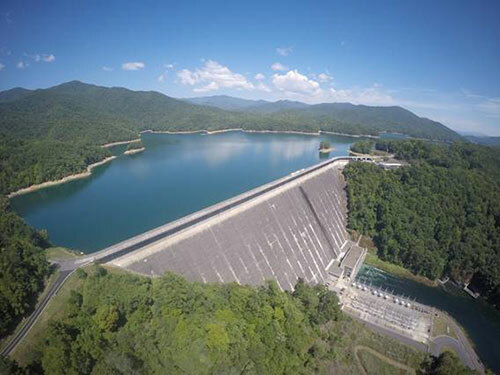 The upper stretch of the lake fishes much like a tailwater river, and a close eye on generation schedules from Fontana Dam is highly advisable. Both lakes — the 26 mile-long Fontana and the smaller Cheoah — provide exceptional boating for recreation and fishing.